2 Comments on First Trip: To the Mountains! Living in Calgary for the past 10 (11? 12?) years I have spent my fair share of time in the Rocky Mountains, particularly in Banff National Park. I love me some Lake Louise… skiing, hiking, showing it off to visiting friends, heck that’s were N and I got married! 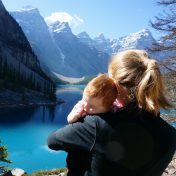 So for baby H’s first trip it only seems appropriate that we head to Moraine Lake (some place that seemed to continually be missing from my repertoire). So in the beginning of September, with baby H being 2 months old, we headed out. You will be changing your baby everywhere and anywhere… parkade in Banff.. no problem, trunk of the car… naturally, park bench… bring it! Everyone loves a baby. Walking around with baby H you could see the smiles from everyone as you walked by. Even going for lunch in Banff, the servers loved seeing a baby. Moraine Lake… Crazy busy… but so beautiful! Extra clothing, while not always necessary, can really come in handy… for example when baby decides she must poop while Dad is carrying her and you don’t realize untill you are back at the car and it is everywhere… not that I am saying that happened or anything… haha!